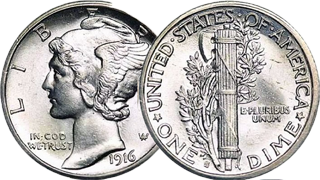 The Mercury dime coin (also referred to as the Winged Liberty Head dime) was struck by the United States Mint from 1916 to 1945. It gained its common name as the obverse depiction of a young Liberty, identifiable by her winged Phrygian cap, was confused with the Roman god Mercury. The reverse of the Mercury Dime coin depicts a fasces, symbolizing unity and strength and an olive branch, signifying peace.